Is The Media Trying To Create Racial Conflict? Congratulations, Mr. Codajoy. The last horse finally crosses the finish line. Every time I turn on the television, I see all of the broadcast networks are still carrying the Trayvon Martin story as their hook. NBC even went so far as to doctor George Zimmerman’s 911 call to make it sound like he was racially profiling Trayvon prior to the shooting. George Zimmerman is half Peruvian and half Caucasian, but the news outlets have consistently referred to him as a white Hispanic to accentuate his whiteness. I had never heard that term before, and I’m starting to wonder if the media has an ulterior motive. Are they trying to create racial strife for ratings? The idea isn’t as far-fetched as it seems. Yellow journalists like Hearst and Pulitzer are often credited with using their newspapers to lead America into the Spanish American War. Heart’s alleged telegram to artist Frederic Remington saying “You furnish the pictures, and I’ll furnish the war,” may be apocryphal, but it neatly captures the mindset of the age. Papers didn’t just cover the news; they created it. Obviously the addle-brained liberals who write the news stories aren’t trying to cause conflict. They’re a bunch of pacifist pussies more comfortable throwing temper tantrums than punches. Clearly there has to be someone pulling their strings. There has to be a sinister puppet master, but who? Really, there’s only one man brilliant and evil enough to pull this off. 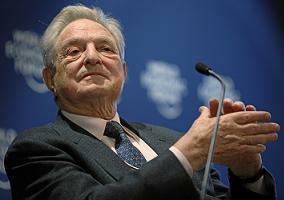 It has to be supervillain George Soros. He owns or funds a diverse media empire that reaches hundreds of millions of people every day, and as a supervillain, he is the only man who would profit from the chaos and bloodshed of a race war. George Soros is truly an evil, evil man.